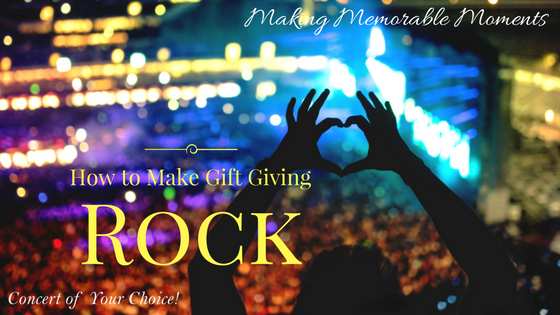 Experience Gifts - Learn how to make Gift Giving Rock! From that question, I learned that my wife’s favorite band of all time was Earth Wind and Fire. Who knew? But good to know! I searched the internet to find out if they were still playing. It just so happened, that year they were playing with the band Chicago, in Chicago! That was only a 4-hour drive from where we were living, so I bought tickets to the concert and when I was picking dates for her Custom Love Calendar, I used the Concert of Your Choice image for that month’s date and paperclipped the tickets to that month’s page on the calendar. Obviously, being the originator of the Love Calendar, I’ve given her a Love Calendar every year since we started dating for Christmas. She really looks forward to them and loves to see what dates I have planned for us for the upcoming year. When she noticed the tickets attached to that month, she was SUPER excited! She’d never seen them in person. By the way – their concert was phenomenal – they’ve still got it! I’d recommend them for sure – even if you’re not a super fan like my wife. Since the tickets were a little expensive and I knew I’d have my car, I chose a hotel that was in the nearby suburbs of Chicago that included breakfast for about ½ of what we’d have paid downtown and we had a phenomenal weekend together. That trip was definitely a highlight of our year! Subscribe to our Blog for other Love Calendar Prep Ideas and please follow us/like us on Pinterest, Facebook and soon on Instagram! While you’re here, make your own Custom Love Calendar for the one you love! It’s super easy and can start on any month!